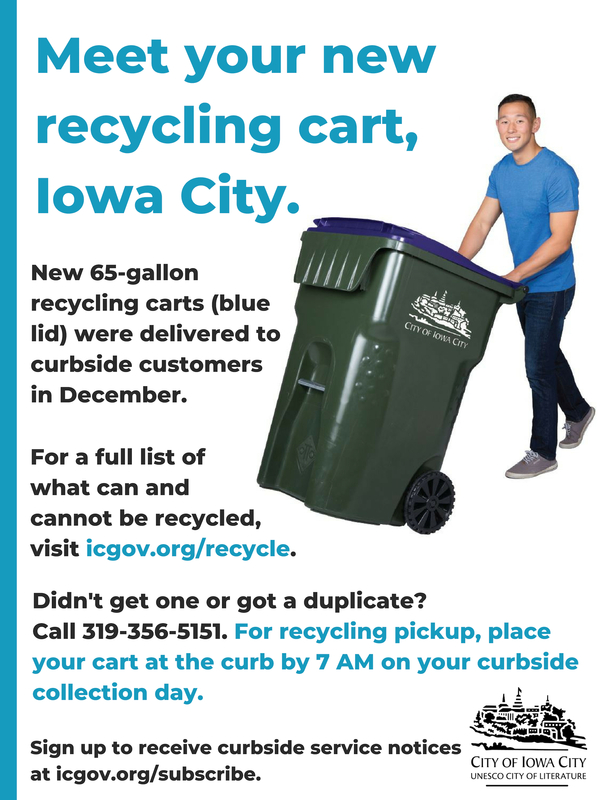 If you are a curbside customer in Iowa City (single-family home up to 4-plex apartment building), you should have received a 65-gallon blue-lidded recycling cart in December. If you did not receive a recycling cart or received a duplicate, please call 319-356-5151. Please note that some households, based on neighborhood logistics and inability to get trucks down some streets, are not eligible for carts. Residents are welcome to keep and re-purpose their older blue 18-gallon recycling bins, but the City will also collect and recycle unwanted bins at the curb or during a drop-off event. Crews will collect old bins curbside on your regular service day during the week of Feb. 4 - 8. RSVP to the Facebook event. Alternatively, return your bin at the drop-off event being held from 9 a.m. to noon on Saturday, Feb. 9, 2019, at the Refuse parking lot, 1200 South Riverside Drive. RSVP to the Facebook event. For information on how to use your cart and what can be recycled, check out the Curbside Recycling Guide. For recycling pickup, place your full cart at the curb by 7 a.m. on your regular curbside collection day, leaving four feet between carts to allow for the truck’s mechanical arm to empty the cart. For more tips on how to use curbside service, watch this video. Since carts have been delivered, residents have responded positively to the new carts. Recycling participation rates and tons of material recycled have increased, reducing the amount of usable recyclables ending up in the landfill. A $106,000 grant from The Recycling Partnership helped the City with the purchase and delivery of carts to the 16,000 Iowa City households that receive curbside services, in addition to a robust, customized public education campaign. The Recycling Partnership is a national nonprofit that leverages corporate partner funding to transform recycling for good in cities and towns all across America. The grant is supported in part by the All In On Recycling challenge in conjunction with the PepsiCo Foundation. For more information, visit www.icgov.org/recycle. To receive curbside service notices, sign-up at www.icgov.org/subscribe.